The combination of the following words “interactive Sherlock Holmes mystery-solving show” sounds like it’s come out of a generator designed to extract money from tourists. But The Game’s Afoot at Madame Tussauds is surprising: both more detailed and well-made than you might expect. For roughly an hour, aspiring detectives can wander freely through Samuel Wyer’s beautifully-designed set, which works rather like a Cluedo board made real. Suspects hover in their respective areas (the inn, the docks), waiting to be interviewed about their part in the murder. Meanwhile, Sherlock Holmes is missing, Scotland Yard is lost without him and Doctor Watson has a hint or two for you if you ask nicely. The mystery’s difficulty is well pitched, neither impossible to solve nor painfully obvious, while the succession of different areas are full of detailed notes, props and newspapers for you to riffle through, making it easy to glean most of the information needed without indulging in too much awkward roleplay, if that’s your preference. If you’re up for a bot of roleplay, however, the acting is fun and frothy, and the cast deal adeptly with the odd challenging audience member – but it’s the sumptuous set that is the real star of the piece. 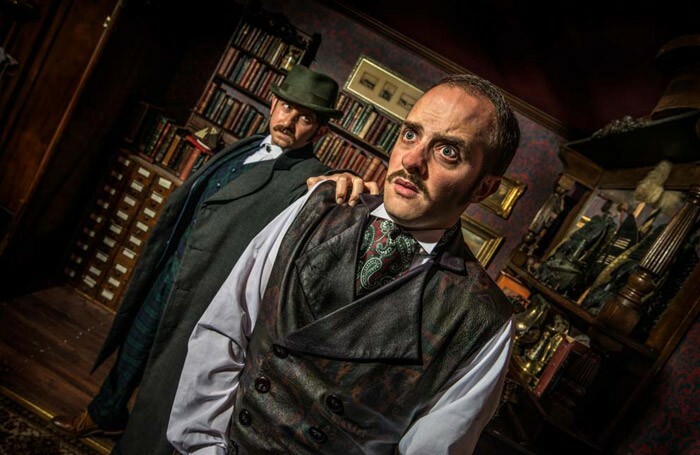 Though the Tussauds setting can give the production the air of a museum’s ‘step back in time’ street, The Game’s Afoot is a delightfully silly, light-hearted, throwaway experience, with some expensive-looking trappings. For all the many things it does well though, it’s difficult to feel that the tickets, at nearly £50 a head, represents value for money.